Patients from Palm Beach Gardens, Jupiter, North Palm Beach and Tequesta have relied on Drs. Riley and Keuning for dental implants and restorations since 1999. We would love to help you regain the power of a full and complete smile. Missing teeth negatively impact your daily life in a variety of ways. When you consider an incomplete set of teeth, you may think first of the detriment to overall appearance. While it is true that missing teeth can definitely deteriorate your self-confidence and self-image, this issue is far more serious than a mere cosmetic problem. Missing teeth can cause functional issues with your bite, change the shape of your face, and contribute to jawbone deterioration. These are all excellent reasons to turn to dental implants to restore our missing teeth. There are multiple options available for tooth replacement – dentures and partials, crown and bridgework – but dental implants offer the most benefits. Unlike dentures and partials, they are a permanent tooth replacement solution, and they offer a great amount of durability and strength in comparison with even crown and bridgework. Why? Dental crowns are securely affixed to implanted titanium posts that act as replacement tooth roots. Instead of anchoring to remaining teeth, they actually anchor to your jawbone. Missing teeth cause bone loss – dental implants help prevent this because they’re the only tooth replacement option that replaces the roots. While many dentists offer dental implants as a tooth replacement option, not all of them are equipped with the experience, training, and technology required to perform the entire dental implant procedure from beginning to end. They can place a crown to replace a missing tooth, but not until another dentist has surgically implanted the titanium post that will serve as your new root. 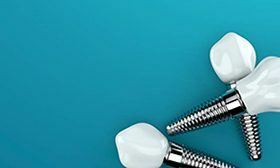 At Juno Beach Smiles, we are proud to say that we conveniently place implants right here in-office. This means that we generally do not have to send you to another office for this service, making your entire restorative process faster and easier. After we have successfully placed your implants and the healing process is complete, our doctors will be able to craft a high-quality restoration to complete it. Depending on the extent of your tooth loss, we may recommend a metal-free dental crown, an implant-retained bridge/partial, or a full, fixed prosthetic. Your restoration will be customized to match your natural dentition, making your new smile look as natural as possible. Offering the complete dental implant process under one roof is just one more way we’re committed to providing exceptional dentistry and unparalleled care to our patients in Juno Beach and beyond. Compared to other options in tooth replacement -- like a fixed bridge or traditional denture -- dental implants offer a wealth of benefits. Nothing else rebuilds a missing tooth from the supportive root structure all the way to the visible crown that helps you eat, speak, and smile. By fusing together with the bone tissue, dental implants stabilize the jaw to reduce the risk of further tooth loss. Implants support both bone and gum tissue. A stable tooth replacement promotes a balanced and nutritious diet. Dental implants make it easier to speak clearly. The replacement teeth are more comfortable and less likely to slip around. A whole-tooth replacement looks more natural than other options. When cared for properly, dental implants can last a lifetime. In cases of more significant tooth loss, dental implants can correct prior dental misalignments. The prosthetic crown, bridge, or denture is highly customizable to match your smile needs perfectly. Dental implants can replace any number of missing teeth from anywhere in the jaw. The indications for this tooth replacement option are listed in more detail below. If you have lost just one tooth, a single dental implant can help to replace it without affecting the surrounding natural teeth. A supportive implant post will be placed in the area where the root structure was. 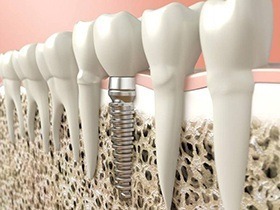 After osseointegration has taken place, a single crown will be affixed on top. When several teeth have been lost, dental implants can prevent those that remain from drifting out of place and keep the jaw bone healthy and whole. A fixed or removable bridge or denture can be retained using a single or several dental implants. Even if you have lost all of your teeth, dental implants can offer the utmost in stability for a complete denture. Forget the slippage and discomfort that are common with a traditional denture. An implant-supported prosthetic fits perfectly and can last for years and years. The health of your jawbone, and whether or not you need to have a bone graft before getting dental implants. How many teeth are being replaced. Where in the jaw the implants are located. What the dental implants are made of. Special considerations for anesthesia or sedation. To get a better idea of what your dental implants will cost, you will need to schedule a consultation with our office. Once we have a precise number in mind, we can discuss ways to make the procedure more affordable -- like using dental insurance strategically or financing through CareCredit or LendingClub. Whatever the cost of dental implants, it’s worth the investment for a healthy, long-lasting smile! Dental implants are incredibly strong and have the potential to last for many years. However, your new smile will need a little help from you if it is going to stand the test of time. 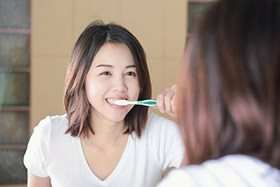 To prevent problems with your implants, it is important that you make oral hygiene a priority, shield your implants from physical trauma, and attend regular checkups in our office. Your diligence will drastically reduce the chances that an infection or other issues will compromise your new smile’s long-term viability. The experienced, skilled team at Juno Beach Smiles provides dental implant placement and restorations. Our office is conveniently located in Jupiter near Palm Beach Gardens. Contact us today, and we will help guide you through the process.